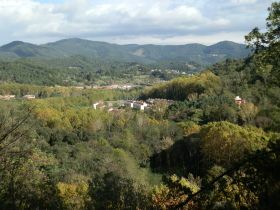 Tardor (Autumn in Catalan) and Montseny beckons. The leaves are just turning colour, there are chestnuts to be collected and the days are bright and clear. 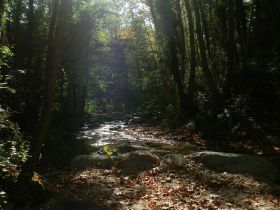 Montseny is the grand mountain that sits between Barcelona and Girona, rising to 1700m it's tall enough to see snow during winter, but its great defining quality for us, is that it is full of paths, streams and deciduous woods - sycamore, beech, oak. The ideal place to stomp through fallen leaves. It's about sixty minutes drive from the Costa Brava so really quite close, but it's a different landscape and almost feels like a different climate. We're walking on spec plucking Arbucies out of the air as we've never visited before. 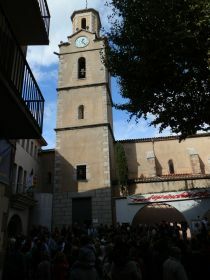 In other years we'd visit Sant Hilari de Secalm or Sant Coloma de Farners. We don't have a planned route as such and our ICC maps at 50,000:1 aren't particularly good for walking so we're hoping to find some paths and signposts to begin with. For the drive we travel up from Hostalric - a walled town with a castle that is easily overlooked but woth visiting. 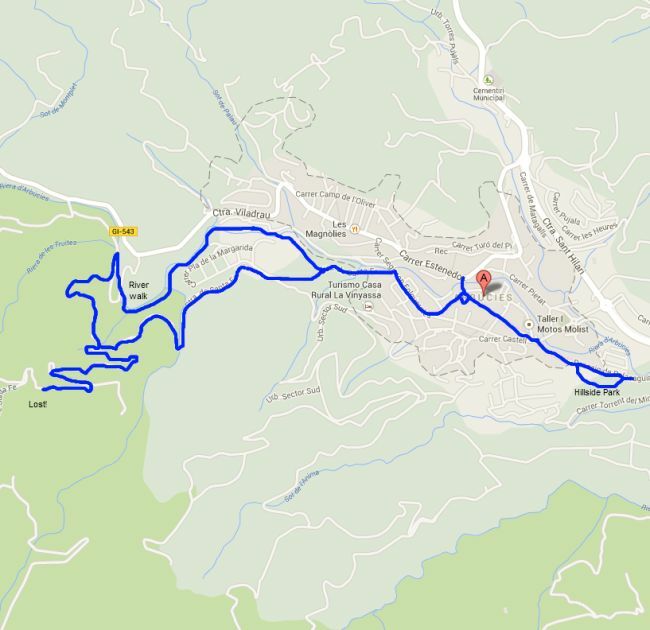 The route takes us past the castle at Castell de Montsoriu which we've visited before and is definitely recommended. It's a castle which stands at 600m high on an isolated hilltop and easily seen from the AP7 if you're driving from Barcelona to Girona. It has fabulous views from the top and a good collection of legends and stories associated with it. 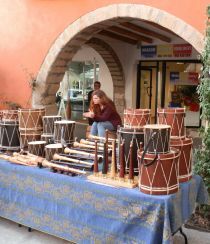 As we arrive in Arbucies the giants are out - it's the Festa de Flabiol - a small Catalan wind instrument - and market day meaning the car parks are full. We part close to the Aigua Aguda bottling factory - people are collecting water from the public spring on the other side of the road - something quite common where the water has a good reputation. As we walk past the spring we notice steps up the hillside and take the path up. The area looks like it was once a park, but water erosion has washed out many lights and path barriers, but it's a fun diversion into the woods. Back on the road we head into the centre past the craft market stalls and into the centre where there's a stall selling drums and pipes. The town has gathered in the main square underneath and independence flag and an orchestra of pipers with drums wearing Barratines, the long red catalan cap starts to play. They're playing the Flabiol with one hand and the drum, slung from their shoulders, with the other and it's extremely good for two one-handed instruments. After the music finishes we continue through the town, a mix of older buildings almost suggesting a grander history and typical Spanish apartment blocks. We walk out along the direction of the river. 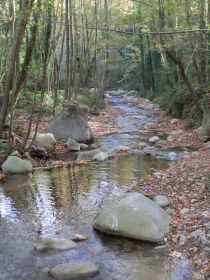 As we're following the road we notice a park below the road to the right and head down into the fallen leaves, following a canalised small feeder stream above the height of the main river below. As we continue the feeder stream meets the lower river and we have to jump across rocks to cross the river to a park on the other hand. Three out of the five of us got wet feet (four out of six if you count our dog). The river runs through the valley with a children's play ground on one side and there are lots of families out walking with young children. It's probably because it's that type of day, the autumn sun is scattering through the leaves of the trees and sparkling on the river water flowing in the valley. Underfoot is dry and scrunchy and the woods feel like they are just enjoying the day. We follow the river crossing once and then twice on small bridges, throwing stones into a mill pool by a tumbledown factory mill, its walls down to about a quarter of their original height. As we follow the river we disturb a grass snake sunbathing on the path. It seems to wake up and slides quickly away into the undergrowth. 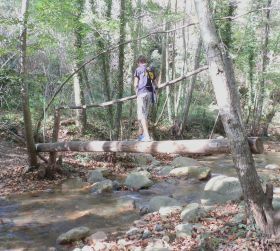 The path crosses a tributary and to get to the other side of the river we have to take a makeshift bridge that has been made from a log supported by two trees with a handrail nailed above it. Eventually we start to worry we're heading too far out. The next crossing is a road bridge - little more than a gravel track above some concrete pipes. There are signposts and we turn up the hill and away from the river. At the top of the path we come to a masia with wide eaves - almost in a Swiss way where the eaves would be used to keep the snow off the path. We follow their track out only to find a cami particular sign at the end - it wasn't marked that way from the bottom. At this point we have an option straight on into the woods, or left and back to Arbucies. We take a chance and head upwards into the woods, and keep going on and on and on. After a while we realise that we're not getting over the hill and we seem to be getting more and more into the woods. Unfortunately on the map we have it's not clear enough to see exactly where we are. We decide to go down to the previous junction, and then continue down and into the town. It's lunchtime now and the town is empty apart from the craft market stalls. The man selling fuet and salamis has his eyes closed and is sleeping at the stall. A little further down, children are doing handstands in the middle of the road. We continue back thoroughly refreshed for the evening.